This post is a short update to my original article on booting Arch Linux on a Bay Trail tablet. I originally wrote this for 4.4.5, but I wasn’t fast enough, and 4.5 was released before the post was completed, so might as well continue with a 4.5 kernel. To simplify the build process I took the PKGBUILD for linux-mainline in AUR and modified it to build a mainline kernel with patches for SDIO WiFi on BayTrail. If you’d like to build the kernel yourself (and you happen to run Arch Linux) you can download the PKGBUILD. The firmware for the rtl8723bs card is in its own package, in keeping with the Arch Linux best practices for separating firmware from the kernel package. Download the firmware PKGBUILD. Or, if you’d rather just have a newer kernel on your tablet which is already running Arch Linux, you can download the pre-built kernel package, and the firmware package. I will be submitting both of these packages to AUR shortly. Turns out you can actually get GRUB working with a menu if you build a standalone version of grub. However, the issue is that even though the grub menu works, there’s some issue with modesetting and you’ll never see any console after grub hands off to the kernel. You can download the standalone version of grub if you want to try, I wasn’t able to get any usable installer environment out of it. You can download standalone grub for ia32 (i686), you will also need grub.cfg. You’ll see a lot of these, however WiFi still continues to work, and the tablet didn’t kernel panic for me in the installer environment. Hopefully someone finds this useful. I’ll have a write up on installing and using Arch Linux on the tablet in the coming weeks. This entry was posted in Embedded, Linux and tagged Arch Linux, Bay Trail, Dell Venue 8 Pro, r8723bs, rtl8723bs, SDIO, WiFi on 2016/03/21 by Hal Martin. This all sounds great, but what do we actually have here? 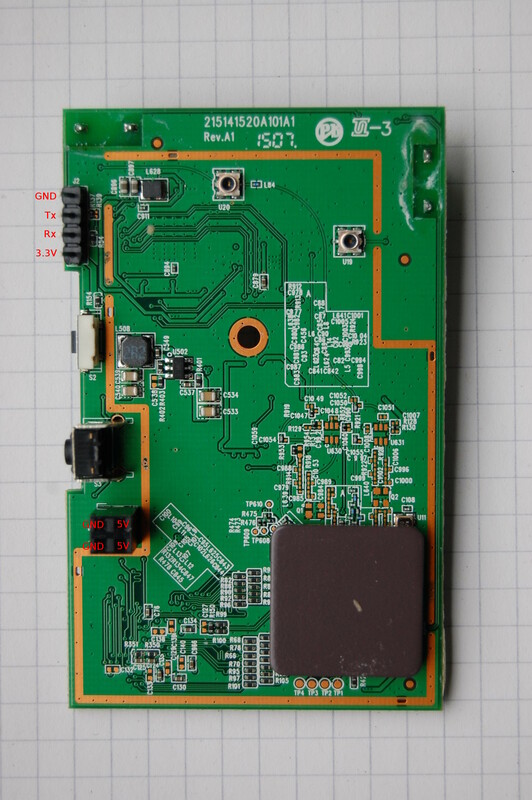 I will preface this post by saying that I started out wanting to port OpenWrt to this device, and I still do, but I got side tracked in my investigation and you’ll have to wait for a follow up post if I ever succeed to port OpenWrt. The UART runs at 57600 8N1. No pictures of the power supply because it’s just a boring 5V power source. Okay, so now that we know the UART pinout, what does the device say when it boots? VFS: Mounted root (squashfs filesystem) readonly on device 31:5. RTMP_TimerListAdd: add timer obj c05a1e20! RTMP_TimerListAdd: add timer obj c053b694! RTMP_TimerListAdd: add timer obj c053f78c! RTMP_TimerListAdd: add timer obj c053f84c! RTMP_TimerListAdd: add timer obj c053f90c! RTMP_TimerListAdd: add timer obj c053f9cc! RTMP_TimerListAdd: add timer obj c053fa8c! RTMP_TimerListAdd: add timer obj c053fb4c! RTMP_TimerListAdd: add timer obj c053fc0c! RTMP_TimerListAdd: add timer obj c053fccc! RTMP_TimerListAdd: add timer obj c053fd8c! RTMP_TimerListAdd: add timer obj c053fe4c! RTMP_TimerListAdd: add timer obj c053ff0c! RTMP_TimerListAdd: add timer obj c053ffcc! RTMP_TimerListAdd: add timer obj c054008c! RTMP_TimerListAdd: add timer obj c054014c! RTMP_TimerListAdd: add timer obj c054020c! RTMP_TimerListAdd: add timer obj c05402cc! RTMP_TimerListAdd: add timer obj c0569e9c! RTMP_TimerListAdd: add timer obj c056df94! RTMP_TimerListAdd: add timer obj c056e054! RTMP_TimerListAdd: add timer obj c056e114! RTMP_TimerListAdd: add timer obj c056e1d4! RTMP_TimerListAdd: add timer obj c056e294! RTMP_TimerListAdd: add timer obj c056e354! RTMP_TimerListAdd: add timer obj c056e414! RTMP_TimerListAdd: add timer obj c056e4d4! RTMP_TimerListAdd: add timer obj c056e594! RTMP_TimerListAdd: add timer obj c056e654! RTMP_TimerListAdd: add timer obj c056e714! RTMP_TimerListAdd: add timer obj c056e7d4! RTMP_TimerListAdd: add timer obj c056e894! RTMP_TimerListAdd: add timer obj c056e954! RTMP_TimerListAdd: add timer obj c056ea14! RTMP_TimerListAdd: add timer obj c056ead4! RTMP_TimerListAdd: add timer obj c053b668! RTMP_TimerListAdd: add timer obj c053b6c0! RTMP_TimerListAdd: add timer obj c053f760! RTMP_TimerListAdd: add timer obj c053f820! RTMP_TimerListAdd: add timer obj c053f8e0! RTMP_TimerListAdd: add timer obj c053f9a0! RTMP_TimerListAdd: add timer obj c053fa60! RTMP_TimerListAdd: add timer obj c053fb20! RTMP_TimerListAdd: add timer obj c053fbe0! RTMP_TimerListAdd: add timer obj c053fca0! RTMP_TimerListAdd: add timer obj c053fd60! RTMP_TimerListAdd: add timer obj c053fe20! RTMP_TimerListAdd: add timer obj c053fee0! RTMP_TimerListAdd: add timer obj c053ffa0! RTMP_TimerListAdd: add timer obj c0540060! RTMP_TimerListAdd: add timer obj c0540120! RTMP_TimerListAdd: add timer obj c05401e0! RTMP_TimerListAdd: add timer obj c05402a0! RTMP_TimerListAdd: add timer obj c0569e70! RTMP_TimerListAdd: add timer obj c0569ec8! RTMP_TimerListAdd: add timer obj c056df68! RTMP_TimerListAdd: add timer obj c056e028! RTMP_TimerListAdd: add timer obj c056e0e8! RTMP_TimerListAdd: add timer obj c056e1a8! RTMP_TimerListAdd: add timer obj c056e268! RTMP_TimerListAdd: add timer obj c056e328! RTMP_TimerListAdd: add timer obj c056e3e8! RTMP_TimerListAdd: add timer obj c056e4a8! RTMP_TimerListAdd: add timer obj c056e568! RTMP_TimerListAdd: add timer obj c056e628! RTMP_TimerListAdd: add timer obj c056e6e8! RTMP_TimerListAdd: add timer obj c056e7a8! RTMP_TimerListAdd: add timer obj c056e868! RTMP_TimerListAdd: add timer obj c056e928! RTMP_TimerListAdd: add timer obj c056e9e8! RTMP_TimerListAdd: add timer obj c056eaa8! RTMP_TimerListAdd: add timer obj c053b63c! RTMP_TimerListAdd: add timer obj c0569e44! RTMP_TimerListAdd: add timer obj c053f7b8! RTMP_TimerListAdd: add timer obj c053f878! RTMP_TimerListAdd: add timer obj c053f938! RTMP_TimerListAdd: add timer obj c053f9f8! RTMP_TimerListAdd: add timer obj c053fab8! RTMP_TimerListAdd: add timer obj c053fb78! RTMP_TimerListAdd: add timer obj c053fc38! RTMP_TimerListAdd: add timer obj c053fcf8! RTMP_TimerListAdd: add timer obj c053fdb8! RTMP_TimerListAdd: add timer obj c053fe78! RTMP_TimerListAdd: add timer obj c053ff38! RTMP_TimerListAdd: add timer obj c053fff8! RTMP_TimerListAdd: add timer obj c05400b8! RTMP_TimerListAdd: add timer obj c0540178! RTMP_TimerListAdd: add timer obj c0540238! RTMP_TimerListAdd: add timer obj c05402f8! RTMP_TimerListAdd: add timer obj c053b710! RTMP_TimerListAdd: add timer obj c053b73c! RTMP_TimerListAdd: add timer obj c053b768! RTMP_TimerListAdd: add timer obj c056dfc0! RTMP_TimerListAdd: add timer obj c056e080! RTMP_TimerListAdd: add timer obj c056e140! RTMP_TimerListAdd: add timer obj c056e200! RTMP_TimerListAdd: add timer obj c056e2c0! RTMP_TimerListAdd: add timer obj c056e380! RTMP_TimerListAdd: add timer obj c056e440! RTMP_TimerListAdd: add timer obj c056e500! RTMP_TimerListAdd: add timer obj c056e5c0! RTMP_TimerListAdd: add timer obj c056e680! RTMP_TimerListAdd: add timer obj c056e740! RTMP_TimerListAdd: add timer obj c056e800! RTMP_TimerListAdd: add timer obj c056e8c0! RTMP_TimerListAdd: add timer obj c056e980! RTMP_TimerListAdd: add timer obj c056ea40! RTMP_TimerListAdd: add timer obj c056eb00! RTMP_TimerListAdd: add timer obj c0569f18! RTMP_TimerListAdd: add timer obj c0569f44! RTMP_TimerListAdd: add timer obj c0569f70! RTMP_TimerListAdd: add timer obj c04d5014! RTMP_TimerListAdd: add timer obj c04d4bf8! RTMP_TimerListAdd: add timer obj c04d4fe4! RTMP_TimerListAdd: add timer obj c04d5320! RTMP_TimerListAdd: add timer obj c04d5260! RTMP_TimerListAdd: add timer obj c04d5290! RTMP_TimerListAdd: add timer obj c04d8fbc! RTMP_TimerListAdd: add timer obj c04d8ba0! RTMP_TimerListAdd: add timer obj c04d8f8c! RTMP_TimerListAdd: add timer obj c04d92c8! RTMP_TimerListAdd: add timer obj c04d9208! RTMP_TimerListAdd: add timer obj c04d9238! RTMP_TimerListAdd: add timer obj c04dcf64! RTMP_TimerListAdd: add timer obj c04dcb48! RTMP_TimerListAdd: add timer obj c04dcf34! RTMP_TimerListAdd: add timer obj c04dd270! RTMP_TimerListAdd: add timer obj c04dd1b0! RTMP_TimerListAdd: add timer obj c04dd1e0! RTMP_TimerListAdd: add timer obj c04e0f0c! RTMP_TimerListAdd: add timer obj c04e0af0! RTMP_TimerListAdd: add timer obj c04e0edc! RTMP_TimerListAdd: add timer obj c04e1218! RTMP_TimerListAdd: add timer obj c04e1158! RTMP_TimerListAdd: add timer obj c04e1188! RTMP_TimerListAdd: add timer obj c04e4eb4! RTMP_TimerListAdd: add timer obj c04e4a98! RTMP_TimerListAdd: add timer obj c04e4e84! RTMP_TimerListAdd: add timer obj c04e51c0! RTMP_TimerListAdd: add timer obj c04e5100! RTMP_TimerListAdd: add timer obj c04e5130! RTMP_TimerListAdd: add timer obj c04e8e5c! RTMP_TimerListAdd: add timer obj c04e8a40! RTMP_TimerListAdd: add timer obj c04e8e2c! RTMP_TimerListAdd: add timer obj c04e9168! RTMP_TimerListAdd: add timer obj c04e90a8! RTMP_TimerListAdd: add timer obj c04e90d8! RTMP_TimerListAdd: add timer obj c04ece04! RTMP_TimerListAdd: add timer obj c04ec9e8! RTMP_TimerListAdd: add timer obj c04ecdd4! RTMP_TimerListAdd: add timer obj c04ed110! RTMP_TimerListAdd: add timer obj c04ed050! RTMP_TimerListAdd: add timer obj c04ed080! RTMP_TimerListAdd: add timer obj c04f0dac! RTMP_TimerListAdd: add timer obj c04f0990! RTMP_TimerListAdd: add timer obj c04f0d7c! RTMP_TimerListAdd: add timer obj c04f10b8! RTMP_TimerListAdd: add timer obj c04f0ff8! RTMP_TimerListAdd: add timer obj c04f1028! RTMP_TimerListAdd: add timer obj c053e5ec! RTMP_TimerListAdd: add timer obj c053e1d0! RTMP_TimerListAdd: add timer obj c053e5bc! RTMP_TimerListAdd: add timer obj c053e8f8! RTMP_TimerListAdd: add timer obj c053e61c! RTMP_TimerListAdd: add timer obj c053e64c! RTMP_TimerListAdd: add timer obj c053e67c! RTMP_TimerListAdd: add timer obj c056cdf4! RTMP_TimerListAdd: add timer obj c056c9d8! RTMP_TimerListAdd: add timer obj c056cdc4! RTMP_TimerListAdd: add timer obj c056d100! RTMP_TimerListAdd: add timer obj c056ce24! RTMP_TimerListAdd: add timer obj c056ce54! RTMP_TimerListAdd: add timer obj c056ce84! RTMP_TimerListAdd: add timer obj c057878c! RTMP_TimerListAdd: add timer obj c05788a8! RTMP_TimerListAdd: add timer obj c05787b8! RTMP_TimerListAdd: add timer obj c056fcc4! RTMP_TimerListAdd: add timer obj c04d24c4! RTMP_TimerListAdd: add timer obj c04d646c! RTMP_TimerListAdd: add timer obj c04da414! RTMP_TimerListAdd: add timer obj c04de3bc! RTMP_TimerListAdd: add timer obj c04e2364! RTMP_TimerListAdd: add timer obj c04e630c! RTMP_TimerListAdd: add timer obj c04ea2b4! RTMP_TimerListAdd: add timer obj c04ee25c! RTMP_TimerListAdd: add timer obj c056f9d0! D1 = -1, D2 = 16, CalCode = 40 !!! rdnssd is already active ! Warning: Do not attempt to modify the firmware of this device if you do not have hardware to rewrite the firmware to the SPI flash. Before I even powered up the device the first time, I took a dump of the SPI flash in case I ended up “bricking” the device (which I did, many times). You can build your own SPI flash reader/writer with a Teensy and a chip clip. I am using the work of Trammell Hudson who gave an awesome talk at 31C3 on manipulating UEFI on MacBook Pros for fun and profit. You can find a copy of the SPI dump of my device (firmware 1.05) here. You cannot flash this image without hardware tools as described above. If you flash this dump, your device will have the same MAC address as mine. This dump should be used only as an option of last resort. I would love to say that I’m an infosec god, and that I can hack anything that moves. Really though, I’m not. I tried to find exploits for D-Link, and it doesn’t seem that there is any shortage of HNAP exploits and other nasty things, but I was unable to get the device to do any interesting things for me, like start a telnet server. 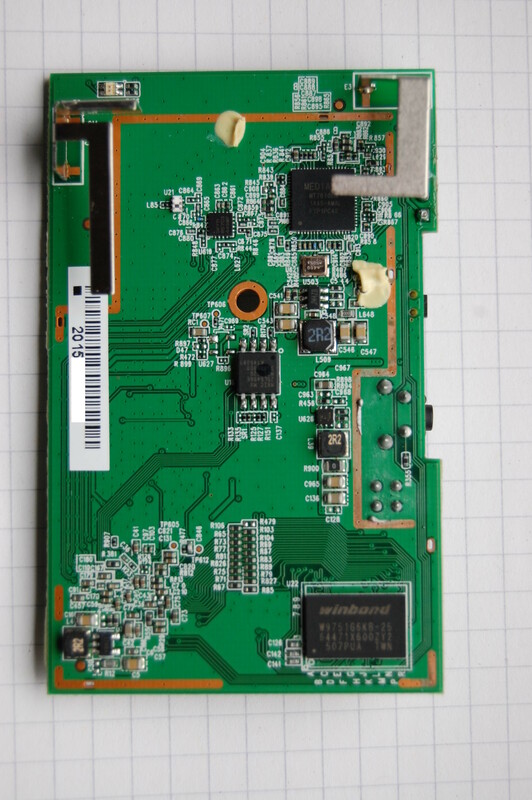 Since my Google-fu is weak, I couldn’t find the firmware images for this device on D-Link’s website at first, so I just disassembled the firmware I dumped from the MXIC. 99968         0x18680         U-Boot version string, "U-Boot 1.1.3 (Aug  8 2013 - 10:32:46)"
327680        0x50000         uImage header, header size: 64 bytes, header CRC: 0xC9616E23, created: 2014-08-22 08:41:24, image size: 909208 bytes, Data Address: 0x80000000, Entry Point: 0x8000C310, data CRC: 0x895D3AE, OS: Linux, CPU: MIPS, image type: OS Kernel Image, compression type: lzma, image name: "Linux Kernel Image"
5177344       0x4F0000        uImage header, header size: 64 bytes, header CRC: 0x225D8E97, created: 2013-09-26 08:58:51, image size: 829684 bytes, Data Address: 0x80000000, Entry Point: 0x8000C310, data CRC: 0xA98529B2, OS: Linux, CPU: MIPS, image type: OS Kernel Image, compression type: lzma, image name: "Linux Kernel Image"
Using dd, we can extract both Squashfs images from the firmware file. I used my dump, but actually I would recommend you just head over to D-Link's website and download the 1.06 firmware image [ZIP] and dump that instead. However, D-Link's firmware is missing the second Squashfs filesystem. Run the 'ol unsquashfs on squashfs1.bin and squashfs2.bin, and you'll have the extracted filesystems of the squashfs images in my dump the firmware. Remember to rename the directory squashfs-root between runs, or specify unsquashfs -d with a different directory name to decompress the images into respective directories. 0             0x0             uImage header, header size: 64 bytes, header CRC: 0xBA3B64BA, created: 2015-01-22 03:48:48, image size: 909200 bytes, Data Address: 0x80000000, Entry Point: 0x8000C310, data CRC: 0x310BA125, OS: Linux, CPU: MIPS, image type: OS Kernel Image, compression type: lzma, image name: "Linux Kernel Image"
Now unsquashfs that, and you'll have firmware 1.06 from D-Link. There are two copies of busybox on the firmware, versions 1.01 and 1.6.1. Some programs in /bin are linked to 1.01 and others to 1.6.1. I have no idea why D-Link would do this. Pretty much everything on the device is run from /bin/cli and /bin/ssi. Other people on the web have analyzed these binaries and can tell you what they do (and how insecure they are). The second squashfs image is the D-Link recovery OS. This OS will boot if the first kernel fails the integrity check performed in uboot. Hilariously, it won't boot into the recovery environment if you flash a bad kernel to the device in Image 1 as I found out. linux4: This is the primary kernel on the device, and the one that will boot if your device has a valid Image 1. This is the firmware that you download from D-Link's website. Despite the label, it is not Linux 4.x, but 2.6.36.
linux4b: Recovery kernel. This kernel will be booted if Image 1 kernel fails verification. rootfsb: Squashfs compressed recovery filesystem. This, along with linux4b boot if Image 1 is corrupt and allow you to flash a firmware through the web interface to restore the device. I must say that the inclusion of a recovery OS is an interesting move on D-Link's part. Since I don't buy their products normally, I'm not sure if other D-Link devices also have this recovery OS on them. It seems like a good idea to include on this device, since if a firmware update fails, since there are no Ethernet ports on the device it's not possible to recover via TFTP, as it would be on a normal router. 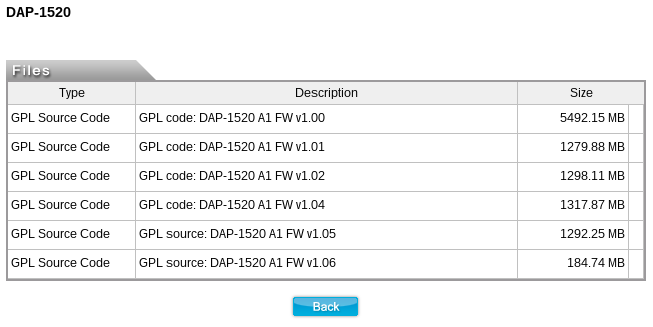 The firmware update from D-Link's website only updates Image 1 squashfs and kernel. Image 2 on my device is firmware version 1.00, and the squashfs filesystem is smaller than the Image 1 OS. If you do some maths on the mtd blocks, you will see that with the stock D-Link layout, the Image 1 kernel can only be 983040 bytes (0xF0000) large. Any larger, and the kernel will not fit in flash. The recovery kernel has to be even smaller, maximum 851968 bytes (0xD0000). Since this device lacks Ethernet ports, it doesn't include some of the features one would consider necessary on a home router, such as port forwarding, firewall configuration, and the like. I suspect that not needing to include these features gave D-Link the space on flash to store a recovery OS. As you can see though, they did have to make some compromises in the allocation of flash to fit the main and recovery OS within 8MB. The device does not function as a WiFi repeater in the recovery OS, only allowing you to reflash a firmware. As much as I would love to cram all of what I did into one post, this is getting long already. 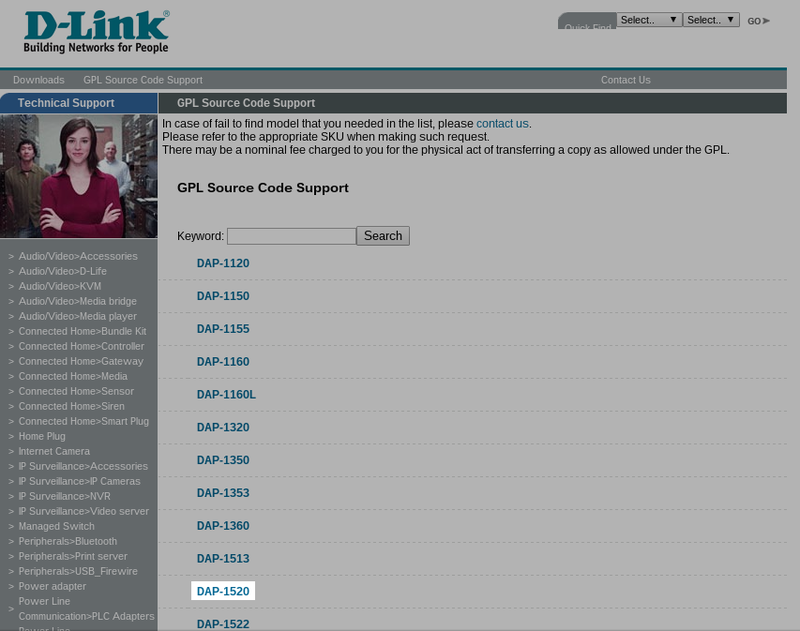 This entry was posted in Embedded, Linux, Networking and tagged d-link, dap-1520, dd, firmware, squashfs, WiFi on 2016/03/06 by Hal Martin.